We’ll provide some insights and review some DFS value players for week 10. Salary ranks are based on the full-slate. Ryan Fitzpatrick (TB) – Salaries: DraftKings (DK) – 4900, FanDuel (FD) – 6100. Fitzpatrick’s upcoming salary ranks him 25th/29th on DK/FD, respectively. Fitzpatrick recorded an 8/15, 68, 1:0 line and 3-30-0 on the ground in second-half relief duty after Jameis Winston (shoulder) suffered an injury at New Orleans last week. Winston is projected to miss a few weeks. The betting lines with the Jets has the game total at 41 points with the Bucs as +2.5 point home dogs. The Bucs’ implied team total is currently at 19.25 points and the Jets are currently at 21.75 points. The Jets rank 24th in fantasy points allowed to QBs and 21st in DVOA against the pass. The Jets also rank 19th in pass yards allowed with 234.4/gm and 18th in points allowed with 23/gm. Tyrod Taylor dropped a 29/40, 285, 2:0 line and 6-35-1 on the ground at New York last week. WR1 Mike Evans has been suspended this week which isn’t great for Fitzpatrick, but if the implied negative game script holds against his former team, Fitzpatrick’s volume should provide a solid floor for a near bottom-barreled price tag. Josh McCown (NYJ) – Salaries: DraftKings (DK) – 6100, FanDuel (FD) – 7400. McCown’s upcoming salary ranks him 11th/14th on DK/FD, respectively. McCown recorded an 8/15, 68, 1:0 line and 3-30-0 on the ground at New Orleans last week. The betting lines with the Bucs has the game total at 41 points with the Jets as -2.5 point road favorites. The Jets’ implied team total is currently at 21.75 points and the Bucs are currently at 19.25 points. Tampa Bay ranks 26th in fantasy points allowed to QBs and 31st in DVOA against the pass. Tampa Bay also ranks last in sacks with 8, 30th in pass yards allowed with 272.4/gm, and 25th (tied) in points allowed with 24.8/gm. Drew Brees posted a 22/27, 263, 2:0 line against Tampa Bay last week. McCown has averaged 20.07 fantasy points per game over his last five, and has multiple scores in every game during this time frame. McCown brings a safe floor in a solid matchup against his former team this week. Carlos Hyde (SF) – Salaries: DraftKings (DK) – 6300, FanDuel (FD) – 6700. Hyde’s upcoming salary ranks him 13th/12th on DK/FD, respectively. Hyde posted a 12-41-0 line and 9-84-0 on 11 targets (all team highs) with a 76% snap ratio against Arizona last week. Hyde’s fantasy points of 21.5/17 ranked him 5th/7th on DK/FD respectively for the position. The betting lines with the Giants has the game total at 42.5 points with the 49ers as +1 point home dogs. The 49ers’ implied team total is currently at 20.75 points and the Giants are currently at 21.75 points. The Giants rank 23rd in fantasy points allowed to RBs and 25th in DVOA against the run. The Giants also rank 28th in rush yards allowed with 125.9/gm and 29th in points allowed with 25.9/gm. Rams RBs combined for a 31-116-2 line and 2-45-0 on 3 targets at New York last week. Hyde ranks 5th (tied) in red zone carries with 23 and rushing TDs with 4. Hyde is currently San Francisco’s three-phase back which makes him a volume driven, script-proof play with a great matchup this week. 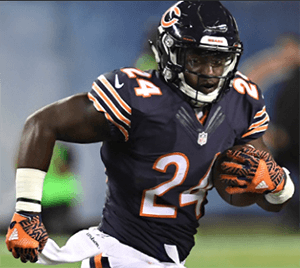 Jordan Howard (CHI) – Salaries: DraftKings (DK) – 6100, FanDuel (FD) – 7200. Howard’s upcoming salary ranks him 14th/7th on DK/FD, respectively. Howard posted a 23-102-0 line and 3-19-0 on 5 targets at New Orleans in week 8. The betting lines with the Packers has the game total at 38 points (lowest on the board) with the Bears as -5 point home favorites. The Packers’ implied team total is currently at 16.5 points and the Bears are currently at 21.5 points. The Bears are coming off their bye. Green Bay ranks 30th in fantasy points allowed to RBs and 11th in DVOA against the run. Green Bay also rank 23rd in rush yards allowed with 118/gm and 22nd in points allowed with 23.9/gm. Lions RBs combined for a 31-60-2 line and 5-71-0 on 5 targets at Green Bay last week. Howard ranks 4th in red zone rushing yards with 76 and 5th (tied) in rushing TDs with 4. Howard also ranks 3rd in the league in carries with 162 and 5th in rushing yards with 662. The workhorse, two-phase back will have a positive implied game script and Fox should feed him all he can handle. Howard would also make a positive correlation play paired with the Chicago defense. Robby Anderson (NYJ) – Salaries: DraftKings (DK) – 5200, FanDuel (FD) – 6500. Anderson’s upcoming salary ranks him 26th/21st on DK/FD, respectively. Anderson put up a line of 4-48-1 on 5 targets against Buffalo last week. Anderson’s fantasy points of 14.8/12.8 ranked him 18th/on both DK/FD. Tampa Bay ranks 29th in fantasy points allowed to WRs and 31st in DVOA against the pass. Anderson has averaged 16.1 fantasy points per game over his last four and gets a sweet matchup this week. Anderson makes for a great value stack option with Josh McCown. Juju Smith-Schuster (PIT) – Salaries: DraftKings (DK) – 5600, FanDuel (FD) – 6400. Juju’s upcoming salary ranks him 19th/21st on DK/FD, respectively. Juju put up a line of 7-193-1 on 10 targets (all team highs) at Detroit in week 8. Juju’s fantasy points of 35.3/28.8 that week ranked him 2nd on DK/FD. His price per point efficiency ranked him 1st on both DK/FD. The betting lines with the Colts has the game total at 44 points with the Steelers as -10 point road favorites. The Steelers’ implied team total is currently at 27 points and the Colts are currently at 17 points. The Steelers are coming off their bye. The Colts rank 31st in fantasy points allowed to WRs and 25th in DVOA against the pass. The Colts also rank 31st in pass yards allowed with 295.5/gm and last in points allowed with 28.9/gm. Juju will be on the Indy fast track and is always a threat for a monster-ceiling game, especially with this matchup. His biggest threats this week are his own teammates. Sterling Shepard (NYG) – Salaries: DraftKings (DK) – 5500, FanDuel (FD) – 5700. Shepard’s upcoming salary ranks him 20th/41st on DK/FD, respectively. Shepard put up a line of 5-70-0 on 9 targets against the Rams last week. Shepard’s fantasy points of 12/9.5 ranked him 25th/29th on DK/FD. The betting lines with the 49ers has the game total at 42.5 points with the Giants as -1 point road favorites. The Giants’ implied team total is currently at 21.75 points and the 49ers are currently at 20.75 points. San Francisco ranks 21st in fantasy points allowed to WRs and 27th in DVOA against the pass. San Francisco also ranks 23rd in pass yards allowed with 244.8/gm and 31st in points allowed with 26.6/gm. Drew Stanton logged a 15/30, 201, 2:1 line at San Francisco in a week where Arizona RBs also ran the ball 39 times. Shepard is New York’s de facto WR1 now, and should continue to see the majority of Eli Manning’s targets along with Evan Engram. Shepard brings a floor, but lacks a ceiling as he has only one score on the season. DeSean Jackson (TB) – Salaries: DraftKings (DK) – 4900, FanDuel (FD) – 6300. Jackson’s upcoming salary ranks him 34th/28th on DK/FD, respectively. Jackson put up a line of 2-25-0 on 4 targets against the Saints last week. The Jets rank 24th in fantasy points allowed to WRs. With Mike Evans’ suspension, all Tampa Bay pass catchers should get a bump in volume, and at this point, Fitzpatrick may be a better play than Jameis Winston. Jackson could make a nice stacking option with Fitzpatrick. Jackson may be worth a cheap flier with an unimposing matchup this week. 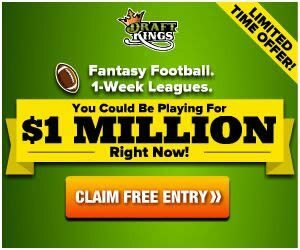 Mohamed Sanu (ATL) – Salaries: DraftKings (DK) – 5100, FanDuel (FD) – 5900. Sanu’s upcoming salary ranks him 29th/34th on DK/FD, respectively. Sanu put up a line of 3-23-1 on 3 targets at Carolina last week. Sanu’s fantasy points of 11.3/9.8 ranked him 29th/27th on DK/FD. The betting lines with the Cowboys has the game total at 50.5 points (highest on the board) with the Falcons as -3 point home favorites. The Falcons’ implied team total is currently at 26.75 points and the Cowboys are currently at 23.75 points. The Cowboys rank 25th in fantasy points allowed to WRs and 19th in DVOA against the pass. Alex Smith recorded a 25/34, 263, 2:1 line at Dallas last week. Sanu has averaged 14.4 fantasy points per game over his last three with two scores. Sanu has brought a consistent floor of late and this game has shootout potential as both teams lack defense. Garrett Celek (SF) – Salaries: DraftKings (DK) – 2500, FanDuel (FD) – 4500. Celek’s upcoming salary ranks him bottom-barreled on both DK/FD. Celek put up a line of 1-9-0 on 4 targets at New Orleans last week. Comparatively, teammate George Kittle posted a line of 3-27-0 on 5 targets at New Orleans. Kittle (leg) has already been ruled out this week. The Giants rank last in fantasy points allowed to TEs and 22nd in DVOA against TEs. Rams TEs combined for a 3-57-1 line on 5 targets at New York last week. Due to Kittle’s injury, Celek provides a bottom-barreled priced, punt play with a good matchup. Cameron Brate (TB) – Salaries: DraftKings (DK) – 4100, FanDuel (FD) – 5700. Brate’s upcoming salary ranks him 13th/7th on DK/FD, respectively. Brate put up a line of 1-13-0 on 4 targets against Arizona last week. Comparatively, teammate George Kittle posted a line of 3-27-0 on 5 targets last week. The Jets rank 28th in fantasy points allowed to TEs and 5th in DVOA against TEs. Buffalo TEs combined for a 6-76-0 line on 8 targets at New York last week. With Evans out, Brate should be Tampa Bay’s primary red zone target as he enters this week ranked 2nd (tied) in TE red zone scores with four. Brate would also make for a solid stacking option with Fitzpatrick. Kyle Rudolph (MIN) – Salaries: DraftKings (DK) – 4600, FanDuel (FD) – 5400. Rudolph’s upcoming salary ranks him 9th/11th on DK/FD, respectively. Rudolph put up a line of 6-27-1 on 7 targets at Cleveland in week 8. The betting lines with the Redskins has the game total at 42.5 points with the Vikings as -1.5 point road favorites. The Vikings’ implied team total is currently at 22 points and the Redskins are currently at 20.5 points. The Redskins rank 29th in fantasy points allowed to TEs and 29th in DVOA against TEs. Seattle TEs combined for a 6-51-1 line on 10 targets against Washington last week. Rudolph gets a great matchup and comes with a value price.